1 paragraph. 199 words. 1282 characters. Estimated time 1’ 10’’. Can you read this text without stopping? Attention is a form of alienation – the point is to know what alienates you. That’s why we always look lost in looking for something – even when we only make a few imperceptible gestures, glued to small bright bubbles. You do not understand who is listening and talking, who works and who is having fun, who really finds something and who is just confused. Have you come here without moving your gaze? Really? Isn’t this effort to do one thing at a time truly unbearable? Look around you – how many other things attract your attention? Now look at yourself from above – can you see yourself? The surfaces of the most densely populated regions on Earth are covered by a dense fog of messages, images and sounds. That’s where people move, interact, sleep. Sometimes more intense noises are heard, quickly absorbed by this fog as it flashes and resounds. Seen from here the planet seems just too loud and distracted to survive – even the glaciers melt too slowly for someone to pay attention to them. Let’s go back to the ground and look closely – we’re all mutating … into something that’s very, very fast. 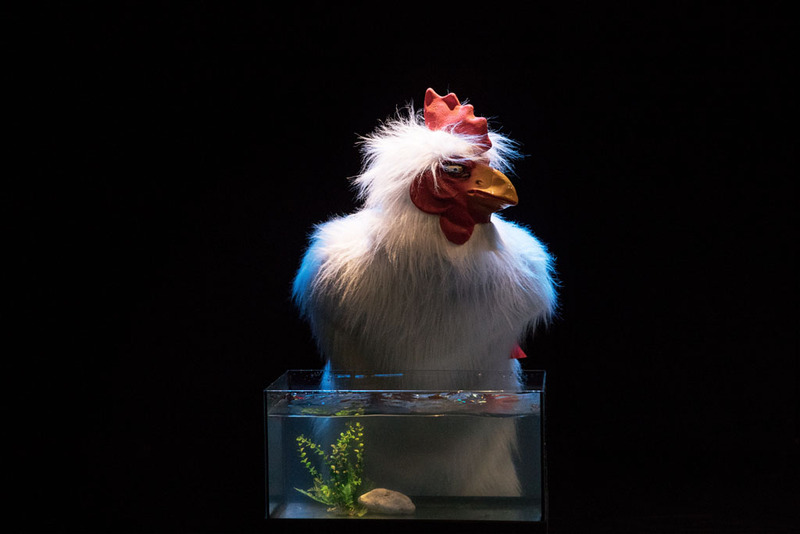 «Overload by Sotterraneo is “just” a playful, chilling show revolving around a solid anthropological fact. In this age of a myriad digital devices, human attention span is inexorably decreasing and fragmenting […]. This idea, in a nutshell, is the starting point on which Sotterraneo’s new show is based. This is constructed as a game which actively involves the audience, and characterized by sharp wit as well as mockery, depicting – not quite reassuringly – how humans are evolving (or involving?)». «In experimental works by companies that have chosen to diverge from classical drama, we find a fanatical attention to detail – the art of polishing aimed to transform body and voice into a theatrical mask, which belongs to the best acting tradition. Somehow, these works all have got to do with ghosts. 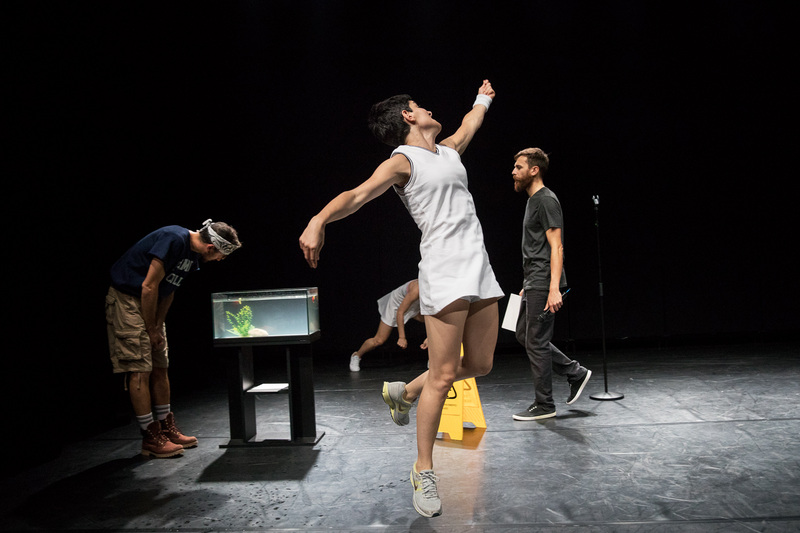 We are not just talking about an ectoplasmic presence here – although indeed there are some -, but also about the ability of a theatrical piece to give body to the obsessions, the ‘ghosts’ of our current times, or simply to what cannot be said or seen. As the title suggests, Overload aims to explore one of the most stringent, problematic issues of our times – i.e., information overload, that has led to the shrinking of the average human attention span. 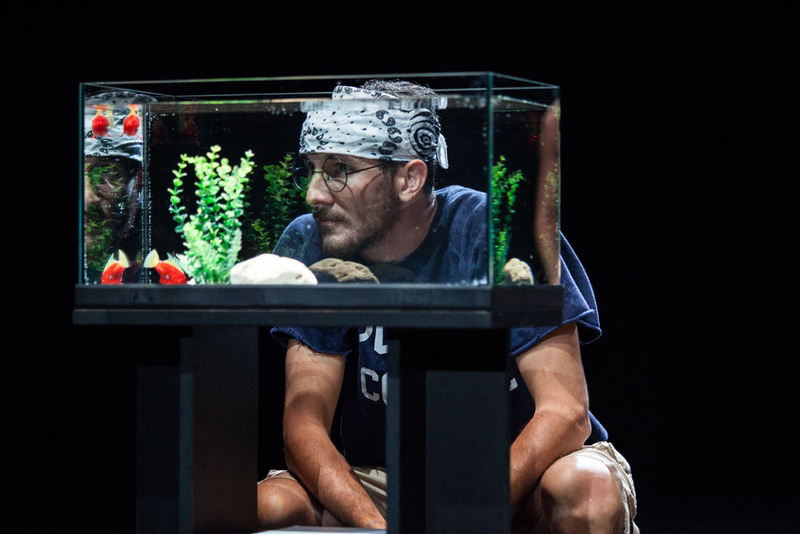 The language used on stage is both light and corrosive, driven to paroxysm in the show’s final scene. After all, what else is theatre for if not to evoke ghosts?». «With their shrewd, ironic, and playful taste of the grotesque, Sotterraneo put on stage the things we miss out on day in and day out due to our rhapsodic attention and anxiety to pile up actions and words. A rambunctious, but carefully thought-out performance, characterized by an ending that will force you to stop laughing and to rethink (from a different angle) what you had seen in the previous fifty minutes. Further, it makes you want to (re)read David Foster Wallace.». 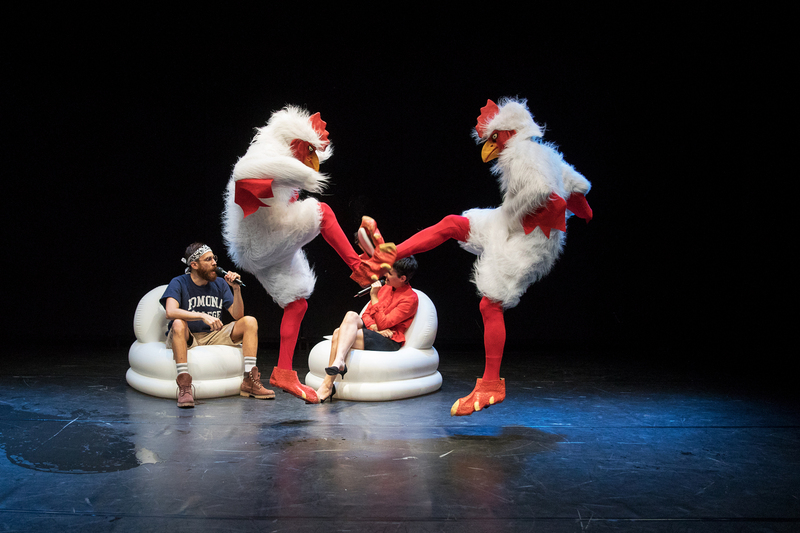 «Through irony and playfulness, Sotterraneo have created an acute, intelligent, witty – and never banal r- eflection on the world of attention, the human ability to pick up the thread, and on how to resist to the many iconic, media, distracting stimuli we are constantly exposed to. Sotterraneo’s Overload is possibly their most mature work, showing deeper analysis and the ability to tackle core issues through sheer, heartbreaking and elegant poetics. 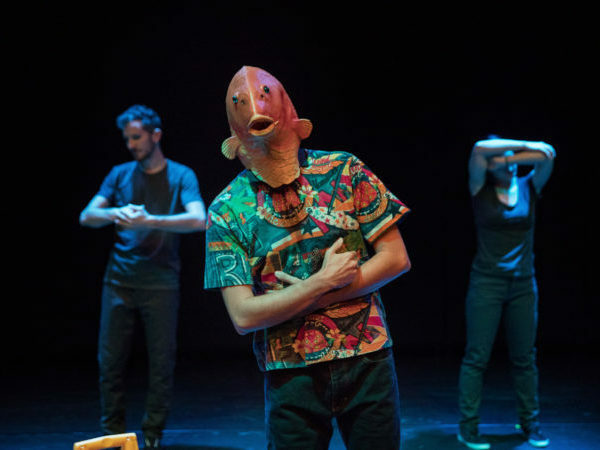 For instance, one scene involves hugging a man-fish who can’t breathe due to lack of oxygen and who reminds us of what we are – constantly meandering from one Internet link to another in search of some truth. That is, if we are lucky. Otherwise, most of the times we are simply at the mercy of a collective and individual dizziness that is annihilating our thought processes. After Overload, you’ll walk out […] more aware of your weaknesses – how information is being fragmented, how we are being distracted from thinking, and attention is in danger of disappearing. This will automatically lead us to a state of unconsciousness, condemn us to an inability to focus on what really matters – that is, to be human and as such share an idea of the world and solidarity of respect toward those who are different from us». «Overload is packed with pitfalls. 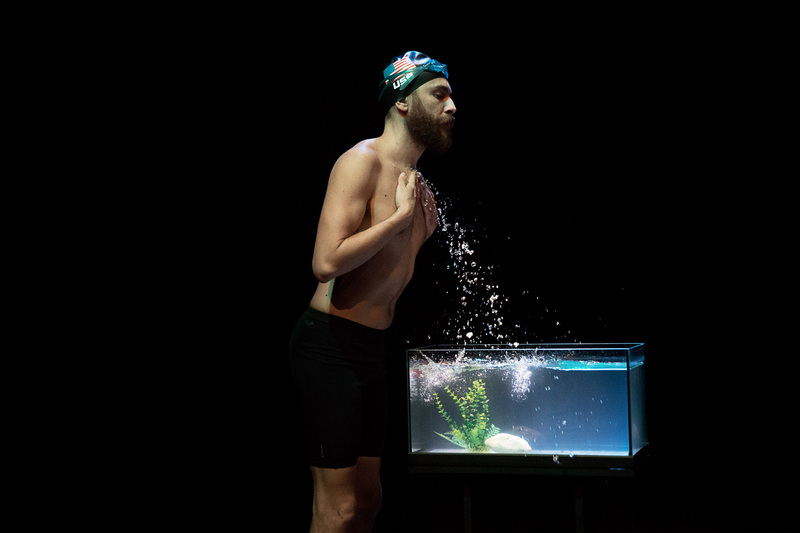 An overload of actions and pressing visions not only tell us of our short attention span and hyper-textuality – the stated focus of this show-, but also make us wonder how this underlying cognitive system came into being in the first place. That very system we are immersed in – without (almost) even realizing it. Because everything seems to be ‘real’ and ‘fake’ at the same time; this is the definition of the theater per se, but a definition which here takes the shape of a bitter portrait of our times». 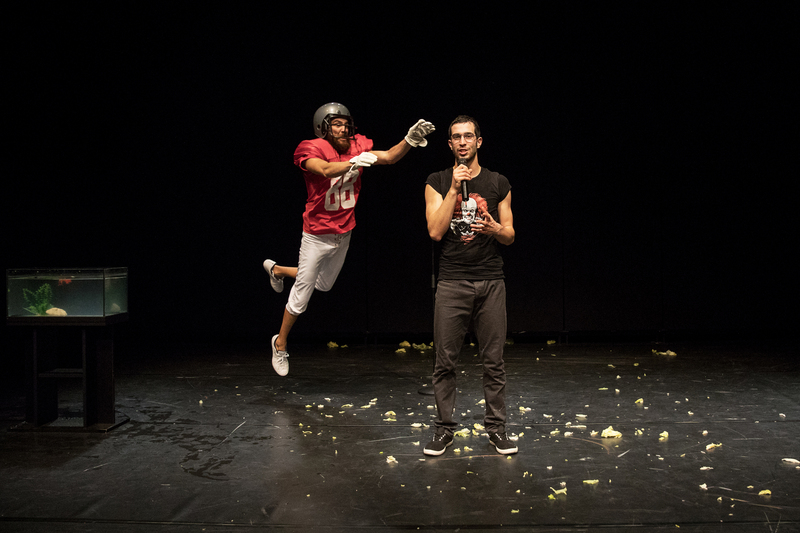 «The theater show created by the Florentine company is in the making as it is performed. There is indeed a need to look at time and space on a par with technological progress. In the meanwhile, for every truth that emerges during the show, there is a component of corrosive bitterness and ironic fatalism ready to digest it». «[…] Attention has turned into a precious commodity – more attention equals more time, thus more money. We live in an era of mirror neurons and perennial advertising, which makes little effort to appeal to people’s fragile desires and might have already exhausted the reservoir of the unconscious. […] This is the main focus of Overload, Sotterraneo’s latest show. US writer David Foster Wallace is featured as a spiritual guide of a journey that is the epitome of our new times. It sums up tensions and aspirations of the 80s and 90s generations, somewhat anticipating the changes under way. Wallace’s intention is to talk about “reality” – or rather how one can survive in the age of information overload. […] Overload is a show that no longer aims to mirror the audience as they are, rather to work as a smartphone or computer screen on which the human image is broken down into a thousand links in an haphazard analogy of advertising interference. There is no mirror to sink into – as the mirror has stolen the ego. The reflecting unconscious has clearly been tampered with by someone else. So let’s just be numb and happy. Indeed, numb and happy. After all, as if under the effect of a sophisticated drug, human neuroses easily find an outlet valve, the world contracts into a few centimetres, and there is no need for much more. We are self-sufficient at last. […]». «We live in a society which demands or allows a virtual world to triumph over the real one – a distracted world emptied of logic and vitality. In this context, Sotteraneo creates an almost fairylike collage with lightness and depth, irony and commitment. Their show is packed with unusual associations, resulting in an effect of grotesque alienation. This is also perceived when one reads Wallace’s literary works, similar to that of a computer used to puts into words the mode of “thought” that precedes the action, unbeknown to its user-reader». 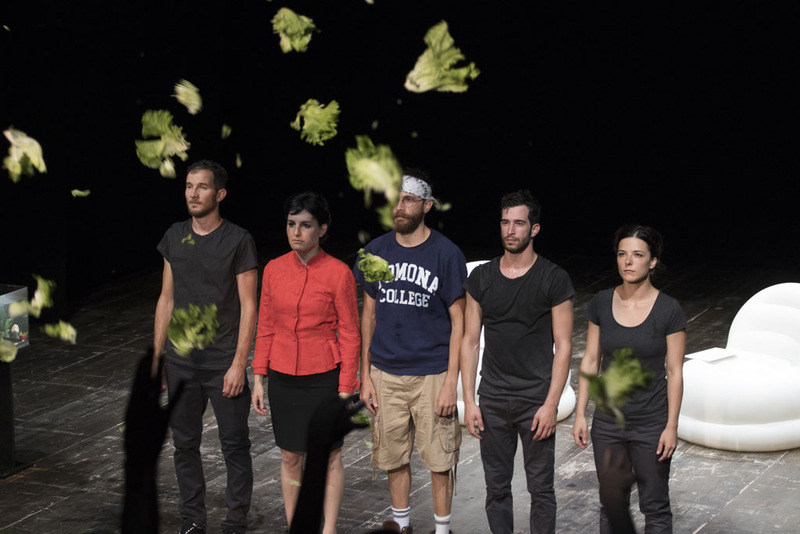 «In Sotterraneo’s Overload an intimate awareness of reality is brought to visual and dramaturgical life. The show’s pressing rhythm does not leave any room to pauses or silences. Instead, it forces us to live in an eternal present, dominated by information overload. […] Sotterraneo do not stop at mere provocation, rather it is a lucid reflection on the contradictions taking hold of our times. Their style is rigorous and bursting, confirming an authentic and forthright fidelity to reality. […] Indeed, in order to survive in this information overload we ought to hold our breath, or learn to breathe underwater – or rather, to change into new forms, to become a man-fish swimming around (at last, alone) in this ‘submerged’ present». 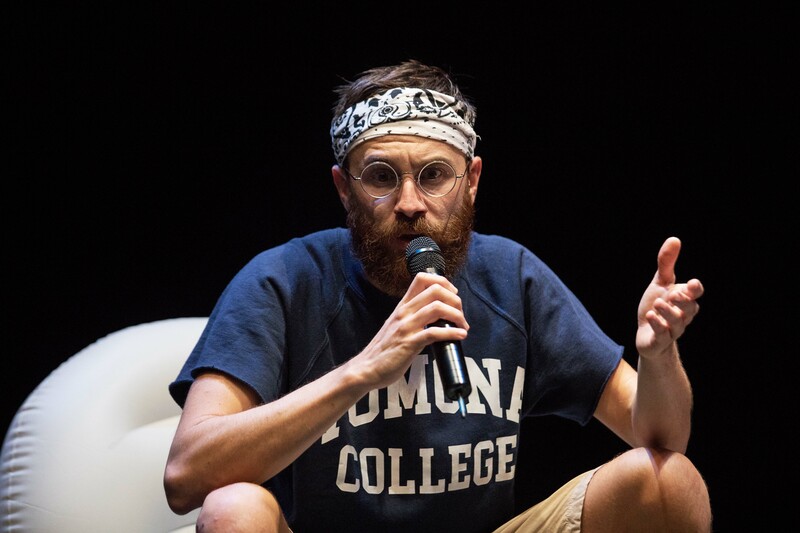 «In Overload the Florentine group Sotterraneo plays with the progressive loss of attention that we would be driving to the abusive use of new information technologies, leading to absurd and surreal effects as ends of this supposed cognitive de cit. The result is a hilarious succession of scenes in the most varied contexts and situations (from the ceremony of the Oscars to a Miss Universe contest) interrupted abruptly last 8 seconds from the start, maximum time before attention it disperses or sued by other requirements. And back again. The result is an energetic pace that does not decline at any time, thanks to the inventiveness and genious of the actors (two actors and two actresses) to connect with the “trending topics” that modulate our everyday experience of reality like hit “tweets”, “podcasts” or screen shots». 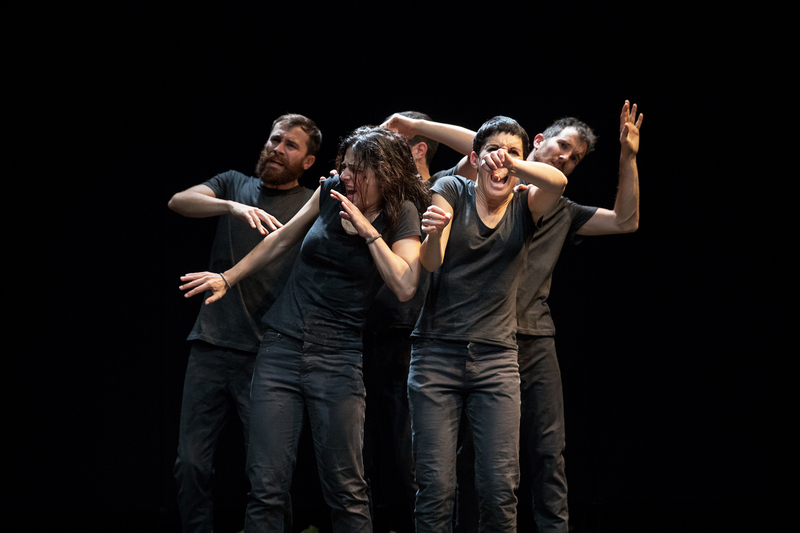 « Overload is delivered by Sotterraneo a multi award winning theatre collective from Florence, a city which if the tourist brochure pictures of domes and pan-tiled roofs are to be believed is a peaceful and serene sort of place. But beneath those tranquil rooftops is a vibrant city in which no day goes as planned when there is a constant stream of distractions and interruptions. It is the nature of these distractions and interruptions that Overload, a work that is performed on the basis that it is still under development, seeks to explore. 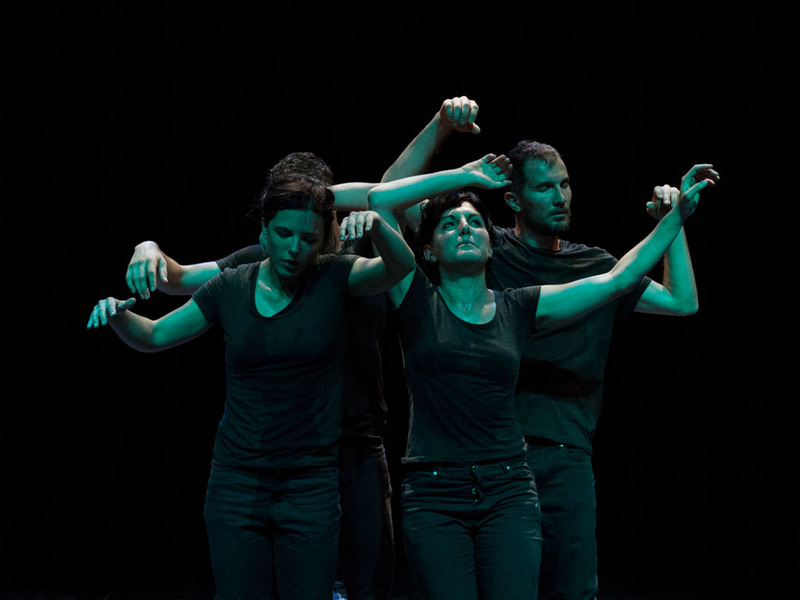 The performance is suitably fast-paced and free-flowing with lots of audience interaction. At one point an Italian swimmer in rubber cap, goggles and budgie smugglers launched himself from the stage directly at me in my front row and centre seat. At another point an Italian senorita invited me to the stage for a slow dance. Fairly-conventional audience participation stuff really. 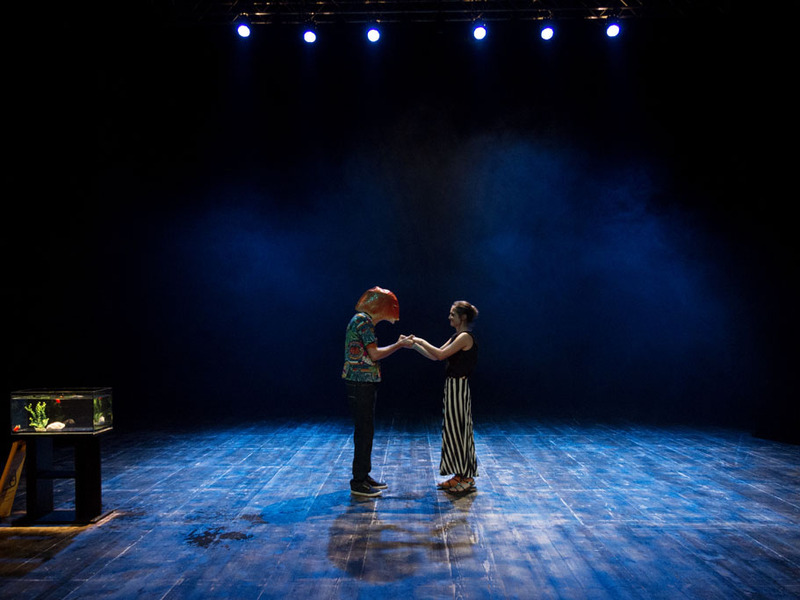 What is not so normal, is allowing the audience to decide the pace of the show, which effectively removes control of the performance from the performers. If we had been of such a mind the performance could still have been going at breakfast. I am back, sorry that took a while the telephone rang and someone came to the door, Etc etc. It’s easily done and hard not to give in. 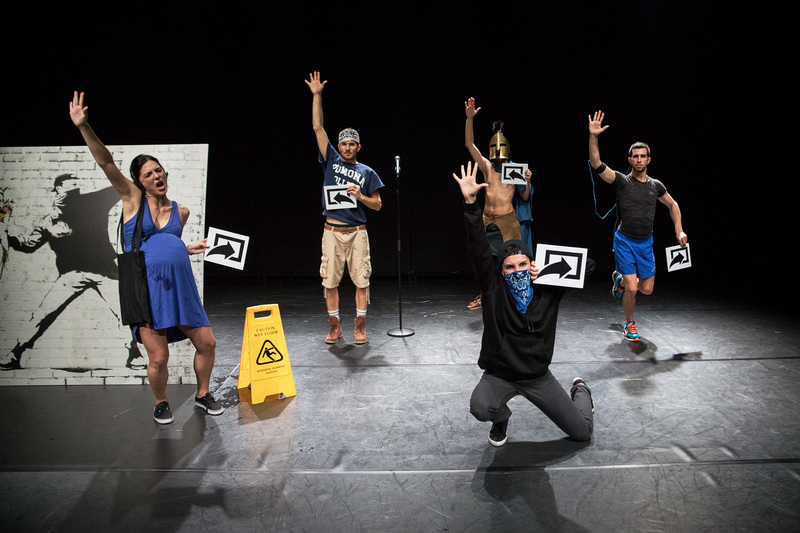 Overload is comedic, at times bordering on farce but always fast paced in a way that reflects the overload of interruptions and distractions that have become part of living in a connected world. At times, it is also emotional as we discover that for each detraction to be able to start, something else must also come to an end, perhaps prematurely, even life itself. One thing it is not is distracted. Throughout the performance, which is both polished and on point, it is hard to believe that this is a work that is still being developed. I ask myself whether such a commentary on modern life will ever be able to reach a point of completion, or if it will just continue to evolve as the way in which we live changes. Overall Overload is great fun. Scratch beneath the surface though and you will be asking yourself if the number of distractions you allow yourself at home, at work and in every aspect of your life is justifiable or something that you need to have a serious word with yourself about». Would you like to know more about this production?